I am a big believer in breakfast. Even if it means just eating a bowl of Cheerios. But because I do that more days than not, when I have a little more time, I like to make myself a big hearty meal. This means making things that involve good hearty breakfast things like eggs, bacon, cheese and toast. When I am feeling particularly crazy, I combine them all together into one of my most favorite breakfast creations: the fried egg sandwich. 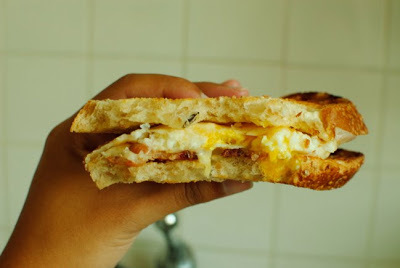 The other night, instead of thinking about the usual puppies and gummy bears as I drifted off to sleep, I found myself thinking about why I love fried egg sandwiches almost as much as I love carbonara. And then it hit me–they have all the same all-star players: bacon, cheese, eggs and some form of carby goodness! Then I started thinking about more puppies and gummy bears and fell asleep. 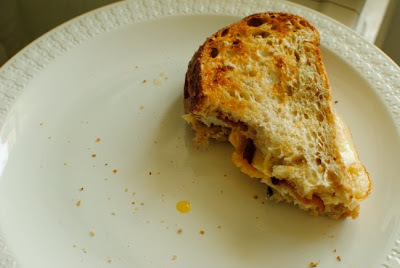 When I woke up the next morning though, the first thing I did was make my fried egg sandwich dream a reality. First I fried the few strips of bacon we had left over from the time I made carbonara last week. 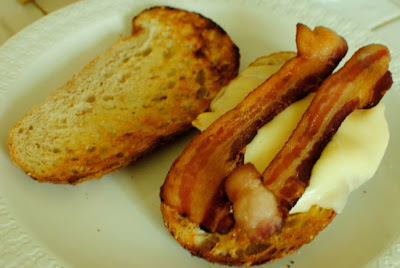 While they were a sizzlin’, I toasted some bread and did them up with an extra bit of butter love. 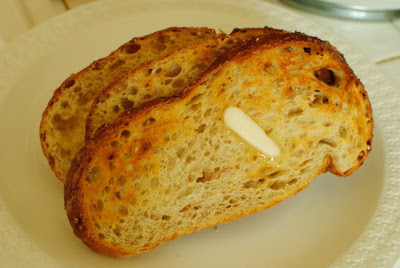 We are currently hooked on wheat sourdough which is the perfect shape for a fried egg sandwich. 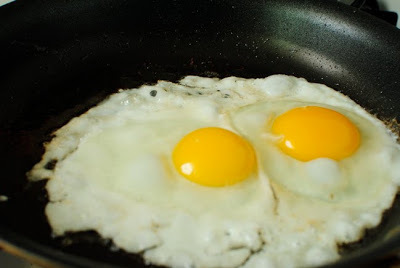 Then came the fried eggs. I like my yolks to have a tiny bit of run to them. 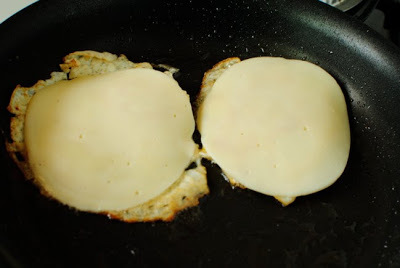 After flipping the eggs over, I hid them under slices of provolone. And then I introduced all the players. So there you have it. Plain and simple, but so good. That looks so good, I've changed my own breakfast plans for tomorrow! This sounds strange, but if you spray a microwave safe cereal sized bowl with cooking spray and poor one scrambled egg with a touch of BBQ sauce and microwave it for a minute and 20 seconds. Then top with cheddar cheese for additional ten second in the microwave. Then slip the egg and cheese on a slice of toasted bread and add avocado on top–mmmm delish!! Look out weekend, this is on my menu but with a sharp cheddar instead. Ooooo, provolone! That must be fantastic!! Here's my favorite comfort breakfast: microwave some potatoes, slice them into home fries, then brown in a pan–then pour some scrambled eggs over the potatoes, and add broken up cooked bacon (I microwave that while the potatoes are cooking). Stir until eggs are cooked and eat. MMMMMMmmmmm. I LOVE breakfast! In fact, I want pancakes for supper tonight! Player number Bacon and player number runny egg are my fav.